As a Google Cast developer, you may be wondering how many devices access your application, how many sessions those devices initiate, and how long those sessions play media. Until now, you needed to implement your own instrumentation to get this information. Not anymore! Today, we’re excited to announce that we’re making all this data available right from the Google Cast Developer Console. The analytics page contains a tab for each metric, an interactive graph of the metric’s values over time, and tables containing the most recent day’s data. The devices tab shows the number of Cast devices that have launched your application, the sessions tab shows the number of Cast sessions of your application, and the average playback tab shows the average length of media playback time per session for your *application. Each tab’s data can be viewed in total, by country, or by sender platform. To see data for a particular country or platform, simply click the appropriate row in the table. Each tab’s data is available on a per-day basis, as well as in seven, fourteen, and twenty-eight day rolling totals. To change the aggregation range, select the desired range from the range picker at the top right. 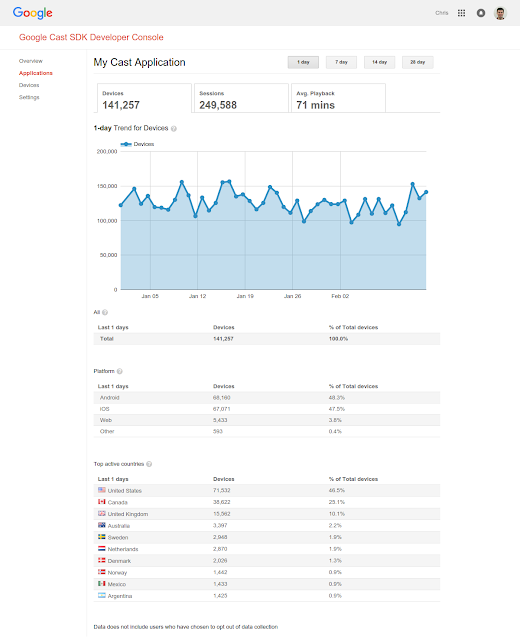 We hope these analytics give you insight into how your Google Cast applications are being used and enable you to see the impact of your improvements. To learn more, see the developer documentation.